Papinayakanahalli is a tiny village in the foothills of the mountain ranges in Hospet taluka, the nerve centre of India’s iron ore mining. About two years ago people of this taluka, located in Bellary district, demolished their mud houses. They dug up the earth and collected huge amounts of iron ore dust. Selling it to traders fetched them handsome amounts. Papinayakanahalli now has freshly built concrete houses. Its people also have tippers and earth movers that help them mine the rest of the land. There are 200-odd trucks in the village now. Its people cashed in on the sudden surge in the price of iron in the global market. Hospet witnessed frenzied digging. Lands were leased to traders. Illegal mining was the order of the day, and night. Trucks overloaded with iron ore jammed roads, even as women and children waited on crossroads holding containers and broomsticks to collect the dust that flew off open trucks. But the bubble has burst. On April 29, the Supreme Court cancelled mining activities of 19 companies based on a report by the Central Empowered Committee. On July 29, it ordered ban on all mining activities in the environmentally ravaged Hospet, Sandur and Bellary talukas in Bellary district. A cloud of uncertainty now hovers. A district that shares its border with Andhra Pradesh, Bellary is known as one of Karnataka’s most backward areas. In 2005, it ranked among the bottom 10 districts in the state’s human development index. But this poor district was also blessed with rich iron ore reserve. As per estimates in 2008, Bellary had close to 1,000 million tonnes of the mineral. The district had witnessed mining for decades. But large-scale extraction began only in the second half of the 1990s. “Earlier, mining was done responsibly,” recalls M Y Ghorpade, the oldest mine owner in Bellary and chairman of Sandur Manganese and Iron Ore Limited. This could be because iron then was not a prized commodity. A truckload of iron ore cost just Rs 1,200, less than the cost of sand. Now, it has reached Rs 7,000 per tonne. Mining was never the main source of people’s living. 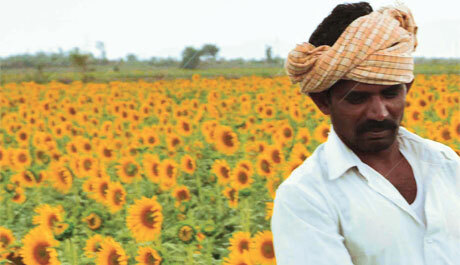 “We used to grow onion in large quantities,” says Moolaimanai Eranna, a farmer at Lakshmipura village in Sandur. Sorghum, finger millet, green gram and pulses were also cultivated in this once picturesque land, he says. This rainfed region had dense forests, grasslands and streams. So much so that when Mahatma Gandhi visited the place in 1932, he had commented, “See Sandur in September.” The place had a big goshala (cow shelter) and almost everyone in the taluka reared cattle. But they were forced to sell them when BJP MLA Anand Singh bought land here for mining. Mining was not the main profession in Hospet either. “As per the 2001 Census, only five per cent of Hospet’s population was directly employed by the mining and steel industries,” says Chandra Poojari of the faculty of social sciences in Kannada University in Hospet. This dry region is partially irrigated by waters from the Tungabhadra dam. Sona masuri, a quality rice variety, and sugarcane, apart from other crops in the unirrigated lands, are grown here. Two factors paved the way for large-scale mining in Bellary—change in India’s mining policy in 1993 and demand from China. As the mining sector opened to private companies, China began importing huge quantities of iron ore to prepare for the 2008 Olympic Games. It developed a technology that required iron dust—high grade ore sized 6-mm and below—for steel production. The price of iron ore soared. From Rs 1,200 per tonne in 2000 it crossed Rs 5,000 per tonne in 2003. The massive loot began. It was around this time that Gali Janardhan Reddy entered the scene. People in Bellary knew him as the son of a constable in the Central Reserve Police Force. Poor at studies, he started a hotel which did not work. His tabloid venture failed. He incurred losses worth crores of rupees in a chit fund company. His luck turned in 1999 when BJP leader Sushma Swaraj stood in the general elections from Bellary. Janardhan campaigned for Sushma. She lost but Janardhan gained as he managed to attain political clout. He entered the iron ore industry a few years later. He bought a mine in Obulapuram village in Andhra Pradesh. 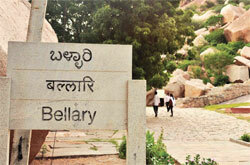 The village shares its border with Bellary. Soon, Janardhan was encroaching upon 11 mines on the Karnataka side of the border. “It was I who had to implement all the orders to encroach,” says V Anjaneya, who was the deputy manager of Obulapuram Mining Company (OMC). He has now turned an approver in the case against OMC registered by the Central Bureau of Investigation. Over the period, Janardhan had gained money, muscle and political power. So powerful was he that he could even alter the inter-state border. “Before inspection from the Karnataka side we blasted the boundary to suit our needs,” says Anjaneya. Almost all mine owners, including Anil Lad, succumbed to his pressure tactics. Those who did not had to suffer losses. When MSPL Ltd, one of India’s biggest iron ore companies, refused to pay him “tax”, it was denied permit to transport ore. A few like D Ramesh, a mechanical engineer and son of former Congress MP from Anantapur district in Andhra Pradesh, adamant not to make any contract with Janardhan, could never start operations. Tapal Narayan Reddy and his son Tapal Ganesh, who own Tumti Mines that borders Janardhan’s, also became victims of his aggression. Ganesh was physically assaulted. The Tapal family, which had completely lost its mine to Janardhan, is livid. “We are traditional miners. Why should we yield to the Reddys?” asks Ganesh. Janardhan was close to Y S Rajasekhara Reddy, the then chief minister of Andhra Pradesh, he informs. In 2008, Janardhan won the assembly elections and became Karnataka’s tourism minister. His two brothers also got a taste of power—G Karunakara Reddy as revenue minister and G Somasekhara Reddy as the chairman of the Karnataka Milk Development Corporation. Janardhan’s close associate B Sriramulu is the health minister. Janardhan himself became the minister-in-charge of Bellary district. The Lokayukta report says the Reddys’ writ ran in the “Republic of Bellary”. Smuggling was smooth. Iron ore production, a mere 1.2 million tonne in 2000, crossed 42 million tonnes by 2010. The impact of indiscriminate mining was devastating. Everything in Bellary turned red—trees, crops, streams. Suspended iron dust polluted the air. Agriculture was the worst hit. Farmers lost their crops, but were offered compensation of Rs 2,000-Rs 3,000 only if their farms were within 300 metres of the road, says Veeranna who runs a school in Papinayakanahalli. Farm labourers started working with mining companies which offered them up to Rs 250 a day. In Hospet, most mines are located near the catchment areas of tanks which provide water from the Tungabhadra. People of this taluka also depend heavily on borewells. But many borewells have now gone dry, and the tanks are filled with silt. The Tungabhadra reservoir, just seven km from Hospet, which irrigates about two million ha of agricultural land in Karnataka and Andhra Pradesh, has also reportedly seen increasing siltation because of mining. “Most patients who go to hospitals in Papinayakanahalli suffer from respiratory ailments,” says Mary Mathew, a social worker in the village. The once fertile land of Sandur now has iron ore and manganese silt in its upper crust. The Lokayukta report notes that miners offered “attractive prices” to unsuspecting farmers for acquisition of land. Mining destroyed the top soil in Kurekuppa, Toranagallu and Bhujanganagar villages in Sandur taluka. Rampant mining devastated Bellary. But no one resisted. Instead, they supported the rule of the Reddy brothers, or participated in abetting the crime. The Sugalamma Devi temple, situated on the highest hill in the reserve forests bordering Anantapur district, was an integral part of the lives of the people of Bellary. In 2006, the mining mafia blasted it. No one uttered a word. Could it be fear of the Reddy brothers? “That could be the reason,” says Phani Raj, professor of civil engineering in Manipal University, who hails from Bellary. But the outcome of the mammoth pirated economy could be another reason, he says. Huge amounts of cash flow through people’s hands. “All zilla panchayat and gram panchayat members, irrespective of their political leanings, receive Rs 10,000 every month from the Reddy brothers for nothing,” he says. During elections, some families are given bikes, televisions and silk sarees. Youth, not even 25 years of age, own two-three trucks. “Money flowed, but there is no real development,” rues the professor. The ban on mining activities will affect about 50,000 people. Many migrant labourers have returned to their states. Those who came to Bellary for good are gloomy. “We have been in this trade for a long time,” says Venkateshwar, a truck driver at Sankar Nagar settlement near Hospet. “Where will we go? What will we do?” About 7,000 trucks were actively involved in mining. Each truck employs three to four persons. Considering this, around 25,000 people will go jobless once the mines are closed. Farmlands have been polluted and water scarcity is acute. No one knows what their effect will be on production. The National Rural Employment Programme is a poor alternative as people will not get more than Rs 120 a day. “Employment guarantee scheme is corrupt,” says T R Chandra Sekhar who teaches at Kannada University. Steel companies like Jindal Steels, BMM Ispat, MSPL and many other sponge iron factories are sure to face a huge iron ore crunch. But as S R Hiremat of the non-profit Samaj Parivartana Samudaya points out, the present uncertainty is an outcome of the private companies’ greed for profit. Lokayukta’s first report had clearly stated that frenzied mining will soon finish all the iron ore in the district. The warning was completely ignored.